As the school year drew to a close Thursday morning, students and staff at Fairley Elementary School continued a 45-year tradition with a bus parade and assembly. 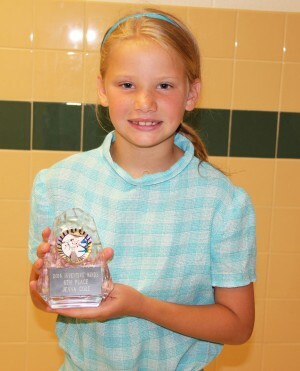 Jenna Cole, a fourth grader at Fairley Elementary School, earns an award for her “secret sink organizer” invention that she created as part of the Inventive Minds competition earlier this school year. Happy Day, a celebration born decades ago under the leadership of former Fairley Principal Dr. Joseph Occhino, offered an opportunity for the entire school community to get together and honor one another for a successful school year. During the assembly, Musa presented several students and teachers with special recognition. 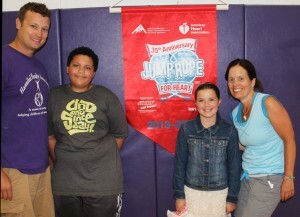 Honorees included Student Council members; the school’s top fundraisers for the Jump Rope for Heart initiative; fourth-grader Jenna Cole for her performance in the Inventive Minds competition; and soon-to-be retiree Eva Corradino for her 37 years as a teacher. Fairley Elementary School physical education teachers Scott Leonard and Lynn Halliwell congratulate students Isiaha Rogers and Kendall Cuyler for collectively raising more than $300 through an American Heart Association fundraiser at the school. The celebration also included the donation of a book to the school’s library, which was presented by Rosemary Occhino-Pilawa in memory of her first husband, the late Dr. Occhino. “As you’re reading this book you’re going to smile, and that’s exactly what Dr. Occhino would have wanted,” Occhino-Pilawa said.